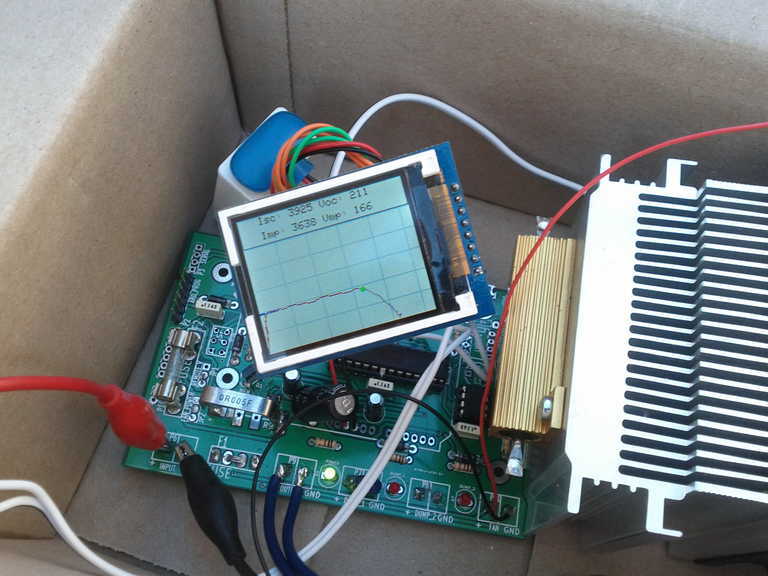 It is very useful to measure the current against voltage characteristic for a solar photovoltaic panel. Here I shown how I built an I (current) against V(voltage) curve tracer for solar photovotlaic panels which is battery powered and can be used ‘in the field’. The output is displayed on a full colour LCD display, along with the interesting characteristic information, such as maximum power point, open circuit voltage and short circuit current. The output is streamed via a serial connection and can be recorded on a computer or using the serial version of the dataduino. The project files are available on GITHUB. 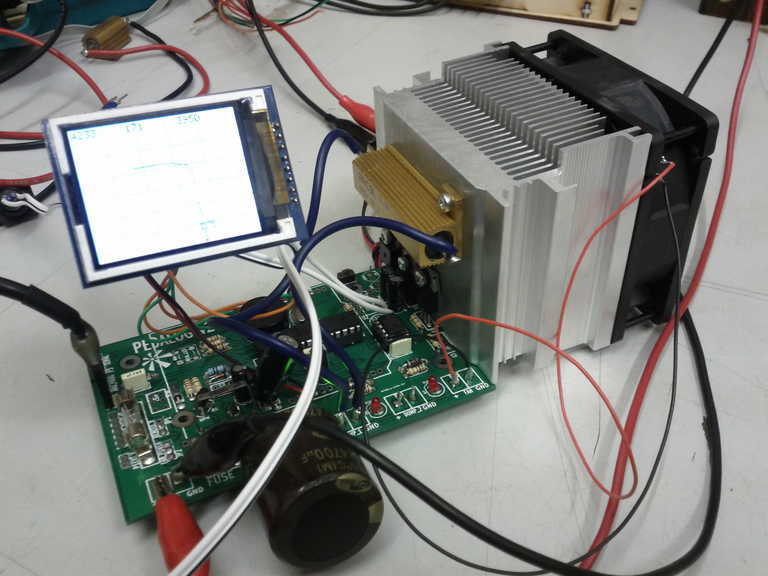 Each solar module is tested under standard test conditions (an irradiance of 1000W/m2, a temperature of 25C and an air mass of 1.5). Under these conditions the modules are ‘flash tested’ and their characteristics are used for the module rating plate on the back of the module. The most useful points to mote are the open circuit voltage (Voc), the short circuit current (Isc) and the current and voltage at the maximum power point (Immp and Vmmp). The actual curve will vary a lot depending upon irradiance, temperature and spectrum. These are the kind of thing used in industry. IV curve tracers are available but are are at quite a high cost as they are robust industrial pieces of kit with only a small customer base. 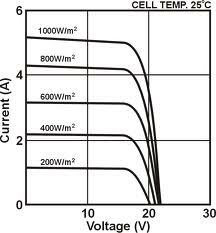 The main requirement of an I-V curve tracer is to apply a load and then measure the current and voltage. These points can be stored and from the data we can draw the I-V curve. In this device I would like to be able to measure panels from <5Wp up to 100Wp with reasonable accuracy (although I’m not going for industrial or academic accuracy). I would like a local display to visualise the data. This visualisation should also highlight the most important parts of the curve. I would also like to be able to store the data either locally on an SD card or onto a computer. I had already created a device which does a lot of these functions – namely measure current and voltage and control a load of some kind – this was the modular pedal power display. I used one of the circuit boards from this as the main ‘brains’. This contains two MOSFETs, along with drivers, a high side current monitor, a potential divider for voltage, along with 5V and 12V regulators. 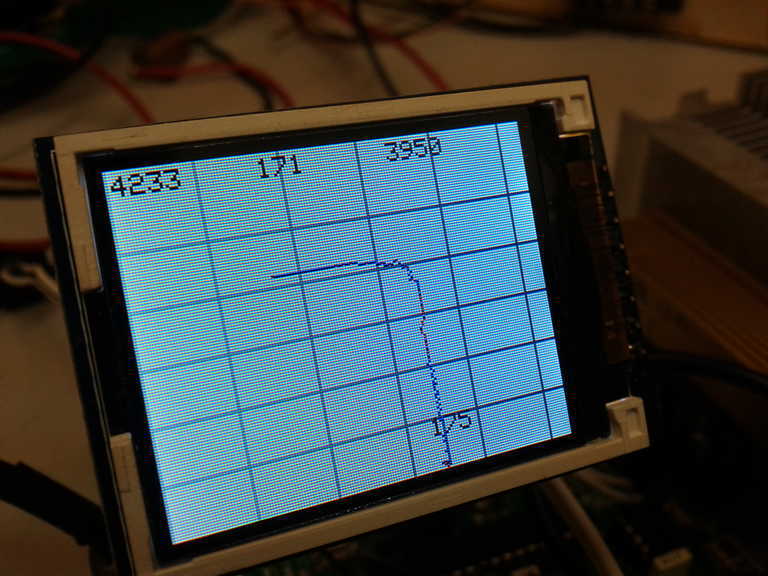 For the output display I had a small backlit TFT LCD module. 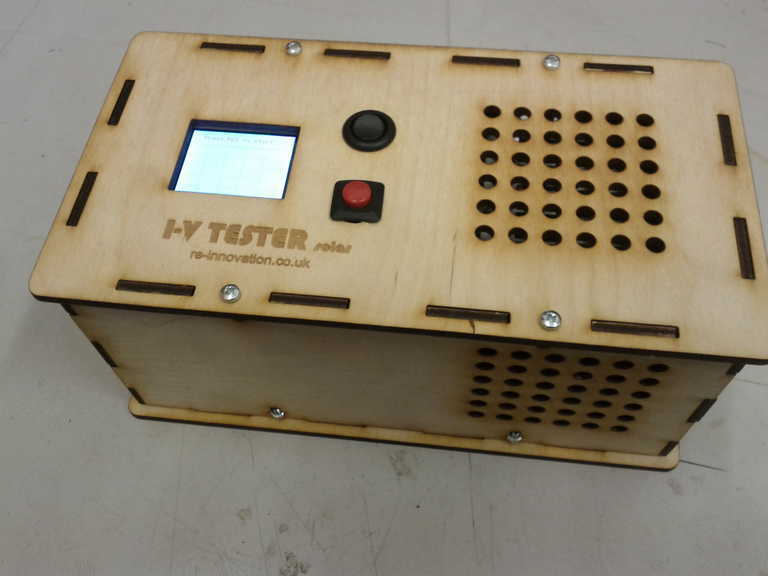 This is full colour and I had already posted on getting it running with the Arduino IDE (which was easy). I wired up the LCD screen to some spare pins on the arduino PCB. The LCD requires 5 lines. I removed the RGB LED (which is used as an indicator on the PCBs) and used these three outputs, alone with two more pins. (I will review the hardware and pin connections at the end). Here is a graph display (during the testing phase – it has been cleaned up a bit now). 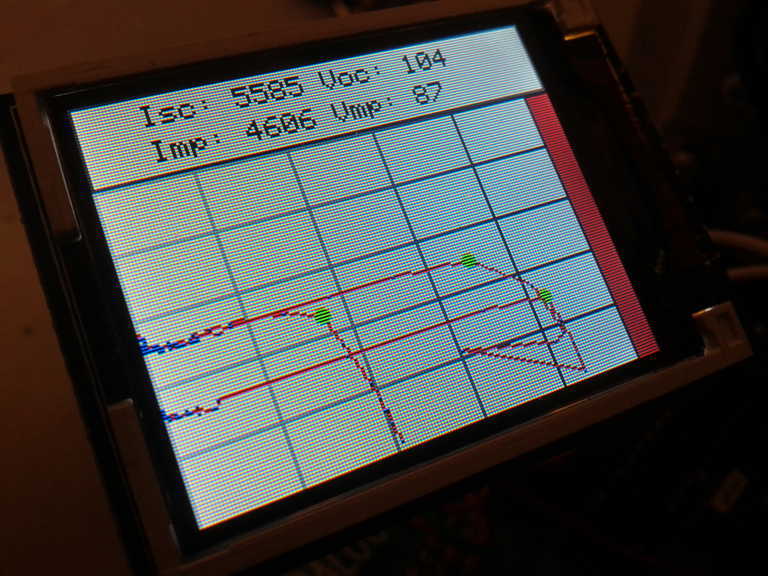 The start-up screen – I had fun making shapes…..
An IV curve from my bench power supply. Set to 21.6V and current limited to around 3.5A. Each time the test is run the trace is added to the graph. If you want to clear the display you just reset the unit. I wanted to show variation in the IV trace as the sunlight changes. It can also be used to test variation with temperature. All of this worked well. I now needed to sort out a load which would give me useful information from the solar PV module. 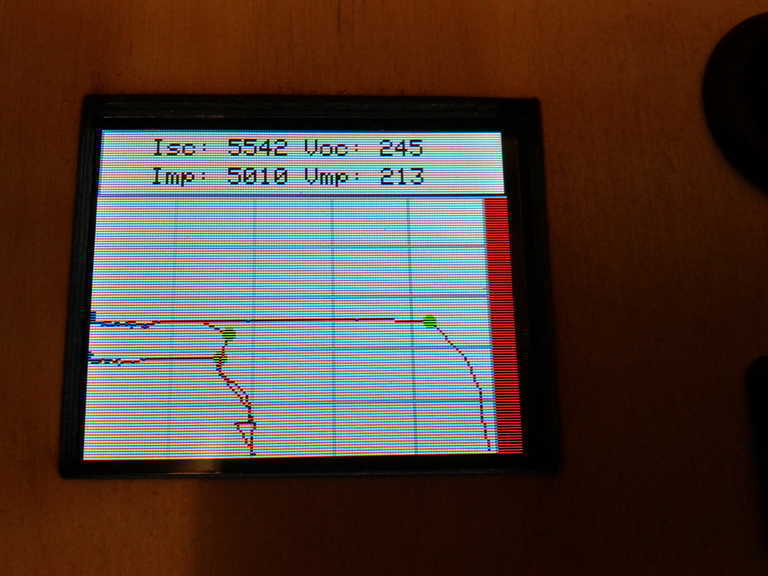 I wanted to measure smaller PV panels with ratings from aroudn 5Wp to 100Wp and voltages up to around 30V. This gives a current range of up to around 10A (a 100Wp 12V nominal panel will have a short circuit current of around 10A). The IV curve tracer will adjust the load which will change the position on the IV curve. It will then read in the current and voltage (averaged values, as these will change a bit). The load will be adjusted until most of the Iv curve has been drawn. The load will be a MOSFET controlled dump resistor. To dump 10A at 12V the resistor will need to be 1ohm. To get the short circuit current then there should be no dump load resistor at all. For testing I used a 1ohm power resistor, as I was using a bench power supply. The solar PV panel is current limited. The current will be limited by the irradiance (sunlight) on the panel. This is an important point, as it means we can directly short circuit the PV panel with no damage to the panel and (as long as we are within the MOSFET ratings) no damage to the MOSFET. 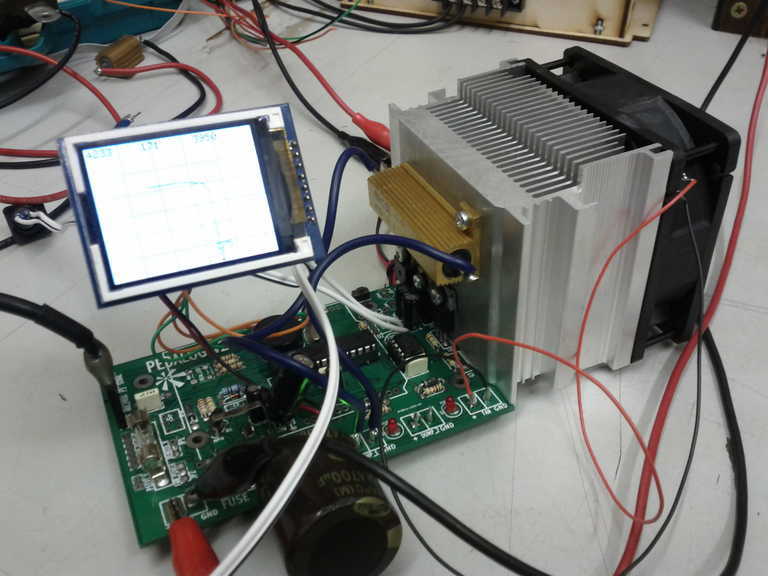 I used a PWM controlled MOSFET with no additional dump load as the load on the system. This means the MOSFET will get hot as it goes through the maximum power point, but with a large heatsink and quickly moving through this point then it should be OK. This output would be smoothed by a capacitor bank. A computer heatsink with fan is used as the main dump heatsink. At present there is only on MOSFET. I will increase this to 3, so each will share a proportion of the current. The 1ohm dump resistor was used for current limited testing (I did not want to short circuit my power supply as it is not current limited like a PV module). Here I have added an additional two MOSFETs in parallel (this replaces the load ressitor). I know the wiring is horrible. If I decide to do an upgrade this will be the first thing to change. It works well and they do not get hot at all, but, due to the reduced ON resistance, the current increases very quickly as the PWM ON time increases. I will adjust the software to make smaller steps at the beginning of the curve to give better resolution. Current is measured via a 0.005 ohm shunt resistor (this is the first version with a 0.05 ohm resistor). An AD8211 high-side current sense IC was used to convert this small voltage into a current reading for the microcontroller. Voltage is measured with a 680K//10K potential divider. 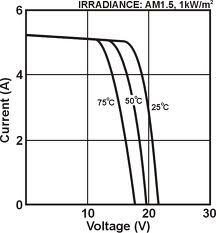 Check out these posts for more info on measuring voltage and current. The current and the voltage signals were analogue values. These are read by the micrcontroller using the analogRead() function. The problem initially was with the accuracy. I used the power supply voltage as the reference voltage for the ATmega328 (with Arduino bootloader). This could vary slightly and hence affect the accuracy of the unit. I decided to use the internal 1.1V reference. I have covered using this reference in this previous post. The accuracy problem comes from the fact that the internal reference could be anywhere from 1.0V to 1.2V, when it is meant to be 1.1V. This can be measured and a calibration factor applied. 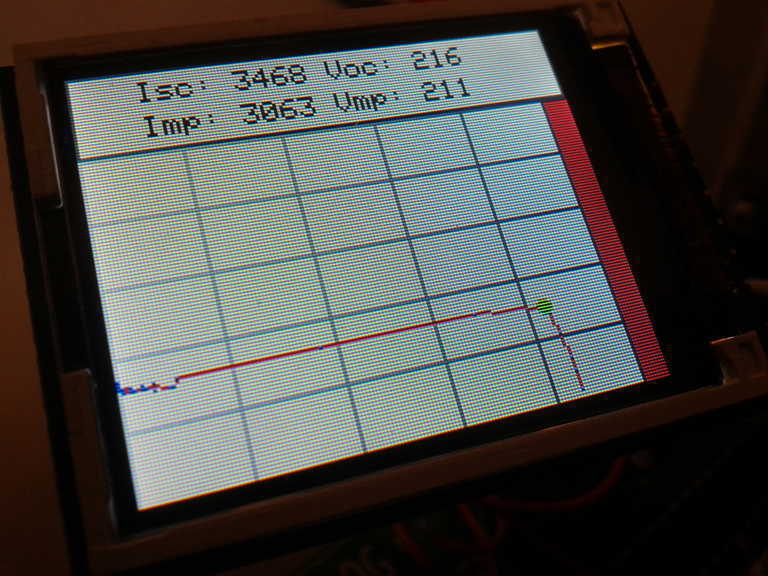 I applied an accurate voltage to the input and measured the reading. This gave me the calibration factor which I stored into EEPROM. This value is then used by the device. 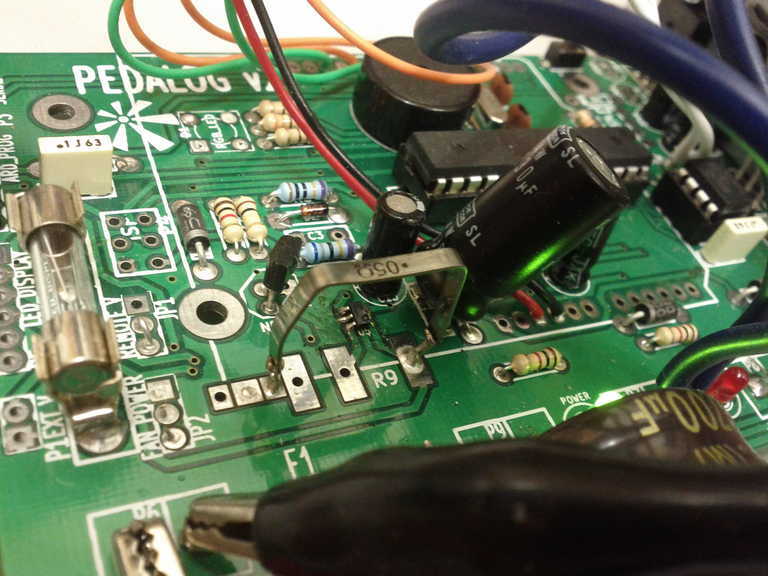 The problem I found was that you must have NO voltage applied to the Vref pin to us the internal Vref. I had the Vref pin tied to the power supply voltage which caused me a couple of hours of head scratching. Once I disconnected the Vref pin (pin 21 on the IC) then I was able to use the internal 1.1V reference. The hardware layout is shown here (although not every component has been shown as I have used a own-built project board for the basis of this project). This is designed as a basic overview of how to wire things up, rather than as a full wiring diagram. The actual Arduino IDE code is available via GITHUB. The code has lots of comments, but has not been condensed/sorted too much. Please feel free to use it. 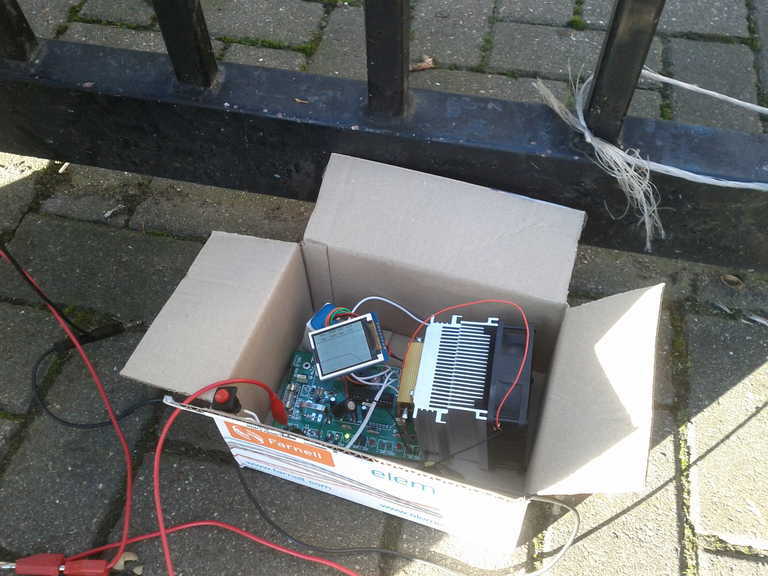 I finished this project at the end of October in the UK, but was surprised to have a sunny day, so I took an 80Wp solar module out into the sun and took a few readings. 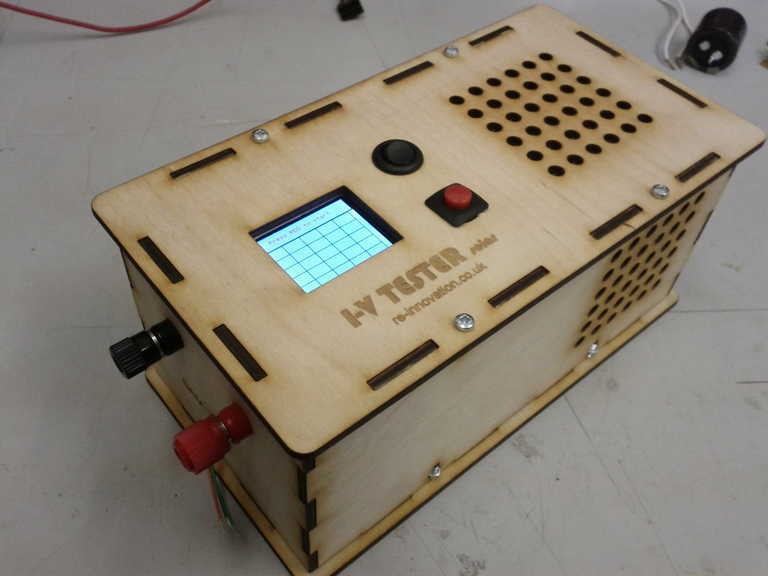 The standard ‘cardboard box’ enclosure…..
Each Y grid line is 2A and each X grid line is 5V. 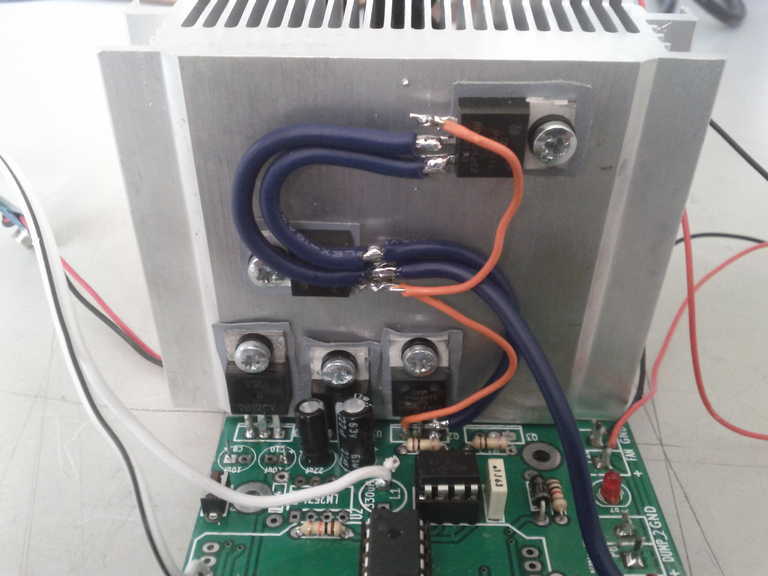 The open circuit voltage is 21.4V, the short circuit current is 3.925A, the voltage at maximum power is 16.8V and the current at maximum power is 3.648A, giving a maximum power of 16.8V x 3.648A = 61.3W. Not bad for an 80Wp module in the UK in October. The device performed well and produced some quite nice looking IV curves. But I need to do more testing when the sun comes out again. 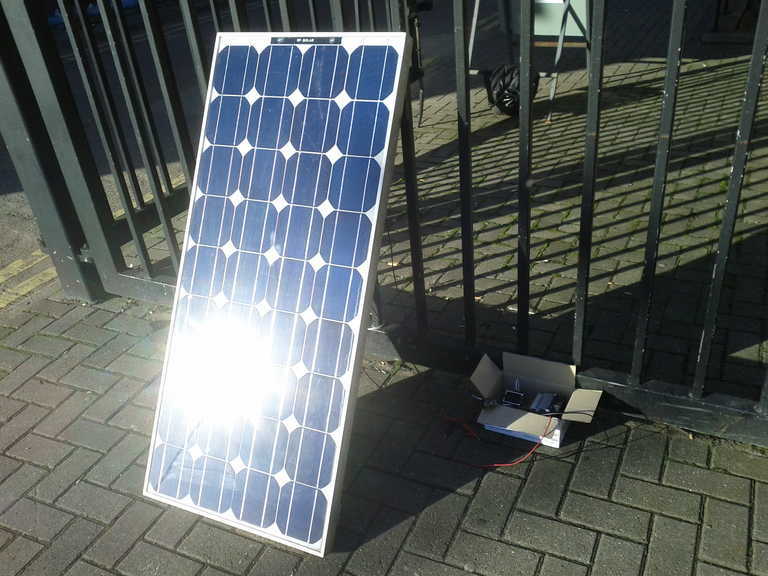 This was a prototype, built as I was interested in designing it and having one for the solar PV workshops I run. If you are interested in having one of these, then please get in touch. This is a prototype and (as always) there is still lots to do. Have you moved on to storing IV data to an SD Card? Quoting John Wax: Have you moved on to storing IV data to an SD Card? I did build an add on which stores the data to an SD card, using one of my DataDuinos. 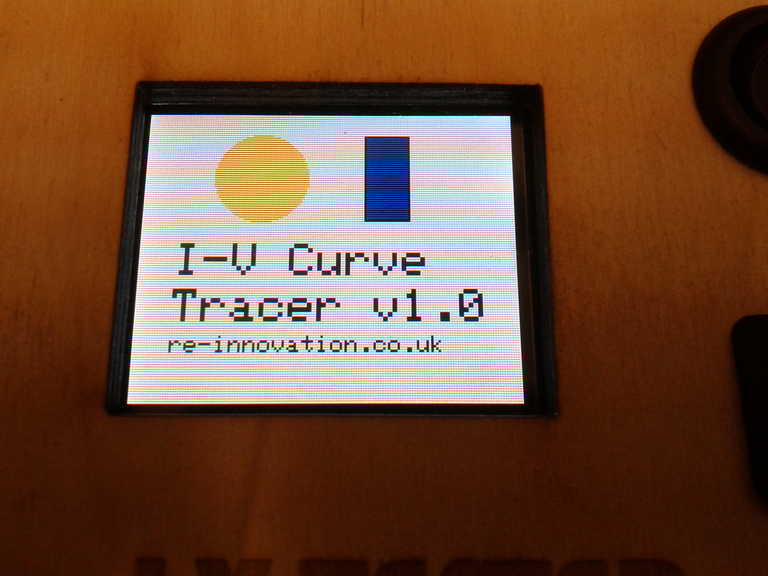 You have done a very nice effort to build this IV curve tracer for solar panels. In my opinion, you should not have this 4700uf capacitor across Mosfet switch. 2. 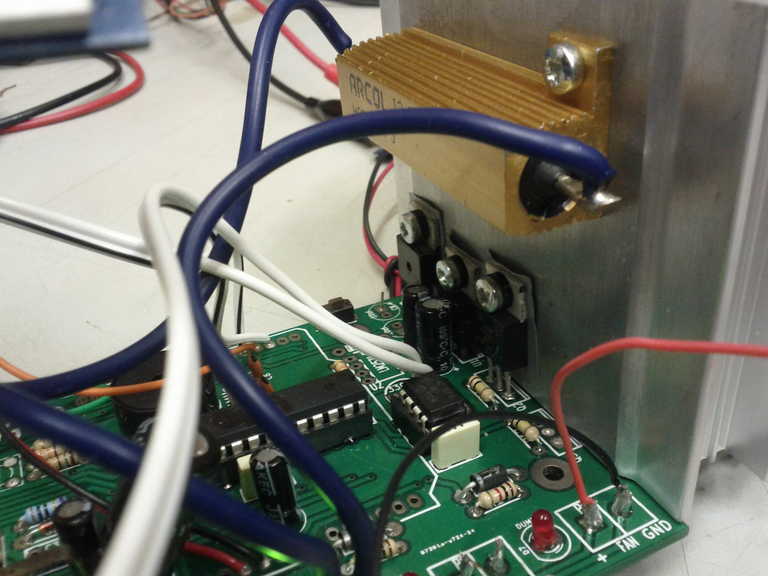 Because of this large 4700 uf capacitor the actual current and voltage waveforms will have lag. Which will mean the instantaneous current will be different than what Arduino will measure. I think instead of 4700 uf capacitor parallel to mosfet switch you should have a low ohmic but high value inductor in series with a switch. Having inductor in series with current path will actually smooth current and the inductor and mosfet switch combination will make a smooth load. Thanks for the comment and very interesting about the capacitor affecting the readings – I see what you mean. The capacitor will provide the current during the test pulses. I’m looking at re-ding this project, so I’ll include your ideas. It’s being used at Stanford in Gil Masters’ CEE176B course. The GitHub page has a link to a YouTube demo video. It is a Raspberry Pi-based design. hello sir….. I have read and see your project on I-V curve Tracer and it got my attention because the project you had done similar with my final year project. If you do not mind can I know more fully about hardware design and also the coding on Arduino. It is a big pleasure for me if you can lend a hand. I looking forward to your reply as soon as possible sir. sir in your complete design are you conclude an optocoupler to connect with mosfet driver?. 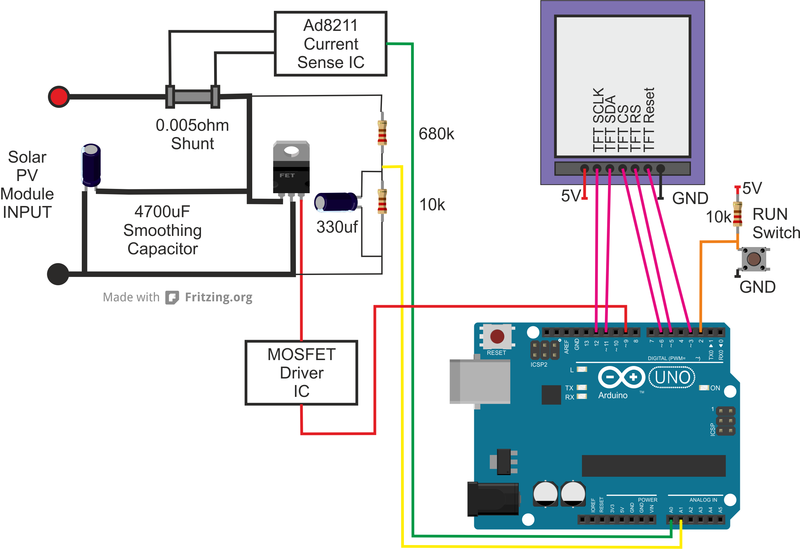 And I curious about the mosfet driver because I review the code iv curve from GitHub, in the code it not show the mosfet driver pin connection and the code for the mosfet driver… please reply sir. I am seeking the answer for the solution. I have not used opto-coupler for the MOSFET switching, but that should also work and provide isolation between the circuits, which might be useful in some situations. I would try to use an off-the-shelf low-side MOSFET driver, such as the TS427, as it is easy and quick…. Sir i had already design my full circuit according to your hardware diagram… i had replace ad8211 with the acs712-30A because in proteus, ad8211 does not had library. 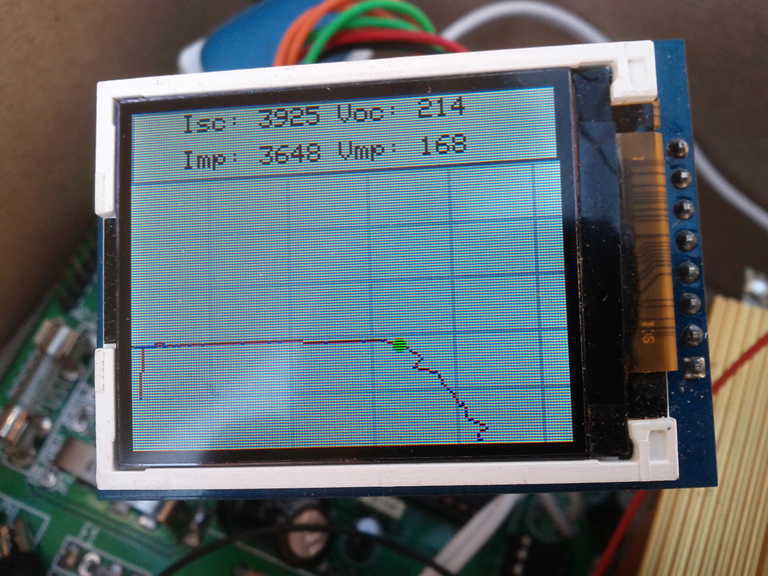 It is the calibration for the ad8211 in your code is the same with ACS712 because the tft does not display the Isc and Imp value that connect with AD0 pin.Second one is, i had to use arduino mega coz tft consume more pin in uno. I had use analog reference 1.1 or 2.56 for the voltage divider and connect with AD1 pin but it still same does not display the result.The 2 mosfet driver i used to connect with IO9 and IO10 that connect with optopcoupler as an isolation can read the signal pwm as i observed with oscilloscope. But in the end it still cannot read the measured parameter to display it with the ftf. I dont know what is wrong whether my design doesn’t comply with your code in term of calibration factor or just my design had gone wrong. In the end the proteus tft just light up and display a zero value for the measured parameter. Of you read this Sir, I beg you to reply. hello and good morning sir. I had order ad8211 ic for curent ic but it is a modal for pcb design.. i had trouble to use it because it is too tiny to test for breadboard.. I would like to ask your opinion sir. Is it any other item that suitable for replacing ad8211 for current monitor because i use resistor shunt. I cant use ad8211 on breadboard with the shunt. I hope you read and reply this.thank you sir. Sorry for delay in replying. This code was written as a simple test and is not maintained nor guaranteed for any application in any way. The code reads the current as an analog value via pin A1. This reads a voltage up to 1.1V, as I am using the internal voltage refeerence. If your sensor outputs a value greater than this, then you will have to adjust this as required. If you can find a current sensor which gives an analog output proportional to the current then that would also work, although the conversion factor (in the code) would have to be changed. So this line would have to be adjusted for your application. i want to make one but for a little solar cell of 1cm2, idis dark IV but we don’t have a sun simulator, so is it possible to test a little cell, in outdoor sun light and get a illuminated curve?